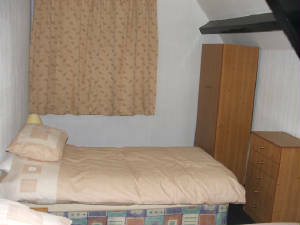 We have a number of twin and triple rooms with tv and tea & coffee facilties available from £15.00 per person per night. Advanced bookings taken. Payments can be made by Cheque Credit Card or Cash. Stay at the Rock House where you find a plesent atmosphere and entertainment at the week ends. 2 minutes drive to the Trafford Centre 10 minutes drive to Old Trafford home of Manchester United.